Last week I made a dinner for my family that was so simple, it seemed almost too good to be true. But it was true, and it was delicious. 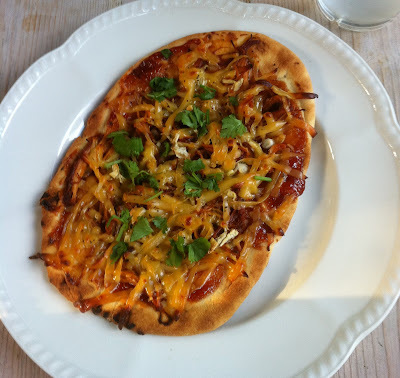 Here's how I made super-simple Barbecue Chicken Pizzas. Early in the day, place boneless skinless chicken breasts (or whatever chicken you like) in the crock-pot. Stir together a sauce made of half barbecue sauce and half vinegar (I use apple cider vinegar; use whatever you like). Cook for several hours, until chicken is very tender. Remove chicken from crock pot. Pull meat apart using two forks. Stop at this point and taste your chicken--you'll be amazed at how tender, juicy, and flavorful it is. The yummy barbecue flavor will be completely infused throughout the meat. Just before dinnertime, preheat oven to 450 degrees. Place whatever you'd like to use for pizza crust on a lightly greased baking sheet. I used naan (Indian flatbread). You could use flour tortillas, crusty bread, or whatever you like. The naan worked very well, and we made one pizza for each family member. Next time I might make an extra pizza or two, just because everyone liked them so much! Spread barbecue sauce evenly over your flatbread. Bake for a few minutes, just long enough to melt the cheeses. If you like, sprinkle with chopped fresh cilantro. This sounds delicious....will have to try it! I love BBQ chicken pizza. We like to use monterey jack cheese and add corn. Great excuse to try the naan that I see in our stores. I wasn't sure how to use it. Thanks! BBQ chicken pizza is one of my favorites!! I use any cooked chicken, cut up and mixed with bbq sauce. I spread bbq sauce on my (homemade, wholegrain) pizza dough, then top with carmelized onions, then the chicken, and finally, mozarella cheese. I have experimented with adding roasted red peppers, mushrooms, and other things to it, but they get lost in the other flavors, so I just stick to my onions, sauce and chicken. We love it! Blessings!